Today we introduce a brand new stamp illustrator to the ME Family, Aida Zamora! One look at her portfolio and you'll be knocked off your feet! It was love at first sight for us! To have her sweet hand drawn illustrations turned into stamps is a treat for all of you! 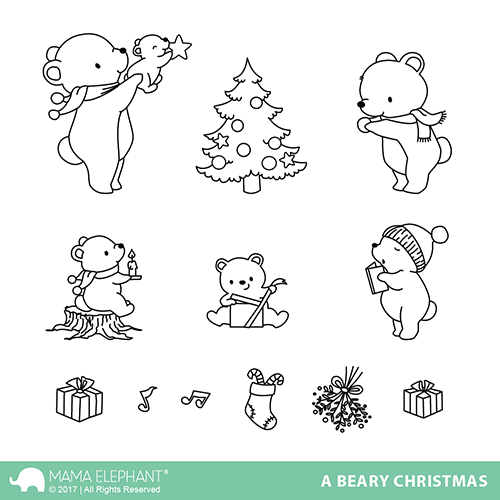 We are beyond ecstatic to bring you Aida's whimsical illustrations, A Beary Christmas is Aida's firsts et with Mama Elephant, so please look forward to more in the future! Another well-loved in house artist for us is Paola Esteron with her classy hand-lettered sentiments. Paola has been sets with us, and this new one - Season's Wishes is just what you need to add to your collection when you need a beautiful sentiment to take center for your projects! The companion sentiments are great for the insides of the cards! Here are my projects using the new goodies! Thanks for coming by today! See you tomorrow as we continue steam-rolling through the Intros! Loving all the new holiday stamps and dies! This is so...... so...... I mean...... too cute to be true !!!! My heart is melting !!! Fabulous work Aida! loving the adorable dears and the sentiments are wonderful as always! cant wait for the release! Love these new sets! Aida's style fits in seamlessly with the mama elephant products! Can't wait to see more from her! Oh!! These sets are so fantastic!! I LOVE the cards that were created with it too. AMAZING!! Awww, such cute little bears! Adorable. The teddies are the cutest thing this Christmas! Wonderful projects! 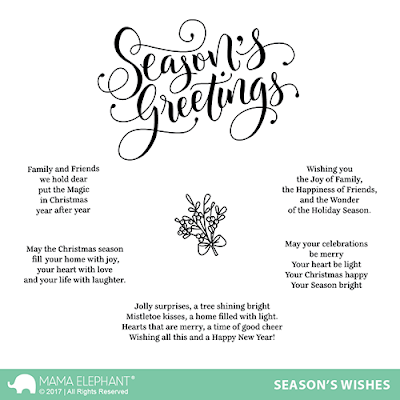 Adorable little bears but REALLY loving Season's Wishes! Oh my! Those little bears are totally darling!!! And I absolutely LOVE the sentiments in the Season's Wishes set!!! Perfect! So cute. I love them all and the darling cards. These are Super ADORABLE!!! Love all the sayings!!! Love the sweet little bears. Great window card. Adorable! I can't stand up the cuteness! These bears are super cute and I love the Season's Greetings font! The bears are so sweet and I LOVE the sentiment stamp set! I'm always on the hunt for inside sentiments.